Thanks to Combell’s API for Reseller Hosting, you can manage the features of your hosting packages at Combell directly from your own programming code or tools. But how exactly does it work? What is Combell’s API for Reseller Hosting? As a reseller of Combell services, you can manage all your products in our My Combell control panel. There, you can create new accounts and adjust settings (DNS records for domain names, extra options for the versions of PHP and countless other minor or major details). For resellers who want to fully automate this process instead of managing the settings manually via My Combell, Combell provides an API (Application Program Interface) that can be integrated with the customer’s own CRM tool or any other kind of provisioning tool. 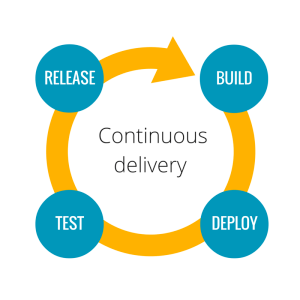 Together with Combell’s AutoGit feature, which we discussed in a previous post, the API plays an essential part in the “continuous integration, continuous deployment” process. The API allows you to create a hosting environment from your own tools, and AutoGit allows you to deploy your code in a secure and efficient manner. You are never really done working on a website or a web service – you constantly need to fix and improve them. This is why Combell offers these tools to customers with Reseller Hosting, so that you can keep optimising your websites without any difficulty. The API allows you to create a hosting environment from your own tools, and AutoGit allows you to deploy your code in a secure and efficient manner. A Reseller just created a new customer, with his new website bakerjack.be, who wants to upload his website. Instead of logging in manually to the My Combell control panel, the Reseller can (often only once) write programming code, in which he automatically creates the end customer’s account, registers the domain name, creates the mailboxes and adjusts all the settings. This way, the website is created while his code is uploaded. Pretty handy, right? However, the API goes much further than that… Actually, you can have almost everything you do manually in the Combell control panel executed via the API from your programming code. Not everything is possible (yet), but Combell intends to further develop the API with extra features depending on the requests of our Resellers. Request an overview of all the accounts you currently own and check when the domain names expire, so that you can notify the owner of the domain in time. List all Linux hosting packages and request details about the webspace used combined with the maximum reserves space. When the customer is about to reach the quota, contact him proactively and recommend him a possible upgrade or give him advice on the space he could free up. If you create your own control panel for your customers, which includes the hosting of the website, you can integrate details about the customer’s hosting package in it. When listing the active hosting packages, you can write a control to check if all your hosting packages have been invoiced to your end customer. You can work faster and more efficiently thanks to the automation from your own programming code. As a result, you can spend more time working on the actual development of the website. During the deployment of your code, you automatically prepare the environment to which you deploy your code. You reduce error rates, because everything happens automatically. With manual operations, you can always forget something of make a mistake. By using different tokens for different developers, you can request with which token a specific action was performed at any time. If you are having a security issue, this will help you sort things out faster. For whom is this API intended? Our API is obviously intended for Combell Resellers, since they have to manage many accounts. But, in principle, any Combell customer who purchased Reseller Hosting and works with his own programming code can use the API to manage his settings in a fast and efficient manner, with very little room for error. When you access the API from your own programming code to manage your accounts and settings, you can work faster and more efficiently, in addition to making fewer errors.